The 50 quarts Igloo Yukon Cold Locker is a perfect size to keep all meat fresh, drinks cool, and room to spare. Yukon Cold Locker cooler comes with very impressive features designed to last and outstand other cooler brands in the market. Yet, this cooler will not break the bank. 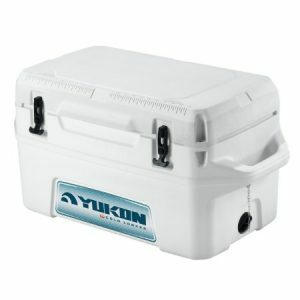 From Igloo’s finest manufacturers, Yukon coolers are probably the toughest and the most durable cold locker made. No matter if it’s for rugged trails, wavy seas, these coolers have extraordinary features which outhaul, outlast and outchill with load capacity measurements according to EN12546-2 2000 testing standards. The Yukon’s Quart Capacity claims exact measurement from the inside so you’ll get the exact figures you paid for; no stretching of capacity here. This is worth noting, as not all coolers are the size of the model size. For example and Yeti Tundra 45 is actually only 37 quarts. Each unit uses an anti-skid plate to keep the cooler in place preventing it from unwanted scratches on and offshore. Its rock solid handles are crafted to be durable yet easy on the hands. 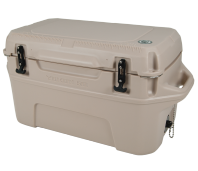 Yukon coolers were constructed with a seamless case, backed up by a 5-year warranty. Yukon boasts the easy grip T-handle latches to hold and to keep the items intact wherever you go. Yukon Cold Locker cooler has 50-quart capacity designed with dual reversible anti-skid pads to prevent damage especially when loading or sliding the unit in any sorts of surface pavements. Its integrated handles are ruggedly designed with wide grip to accommodate gloved hands and large enough for two hands for carrying bulky weight. This is an ideal design for contractors or those in the commercial fishing industry or for outdoor adventures such as hunting, boating and tailgating. Besides the durable outer construction, this cooler has 3-inch thick foam in the lid with gasket and 2-inch foam in the cooler’s body. No worries if you need to travel far, Yukon Cold Locker cooler advertises 7-day ice retention at 90 degrees Fahrenheit with the supreme Cool Riser Technology. It is the only cooler with the infrared technology and efficient UV inhibitors so you won’t have to worry about your contents even if the cooler is exposed under the sun. 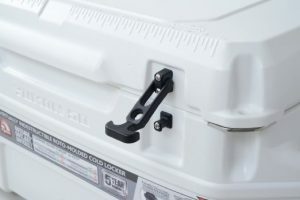 Igloo Yukon Cold Locker Cooler comes with durable rubber latches and stainless-steel hinge pins and hardware built with robust rotational-molded polythylene. The Yukon can hold up to 50 quarts or 47 liters. The unit weighs 33.1 pounds or 14.5 kilograms coming at 33.58 inches in length by 17.03 width and 17.55 height exterior dimensions. The interior dimensions measure 23 inches in length by 10.8 width by 11.7 height. Unlike ads and marketing schemes, the Yukon really means the genuine full-load capacity measuring through the inner portion of the unit. Created to last through wear and tear, the cooler comes with sturdy 5/16 inch stainless steel hinge rods and dual stainless steel locking system for security against theft. The latches are made of heavy-duty rubber to withstand corrosion in all sorts of weather conditions. The oversized drain plug eases cleaning and works for swift flow when draining. The plug has extra large finger grip so you can easily turn or remove the plug whenever necessary. It has a stainless steel tether cord to prevent losing the plug in place. The cooler brings synergistic effect when you use conventional ice with d﻿﻿ry ice. Yukon cooler features the MaxCold Insulation, a creation of thicker thermal barrier without gaps on seams where cold can possibly leak. The gasket completely seals out the heat like a freezer. Tips- While each unit is made to last for years, special care and attention may add to its lifespan. Interior and exterior surfaces should be thoroughly cleaned before and after use. Avoid stains and stingy odors by washing it with mild detergent and water. Keep the empty cooler dry. Baking soda can help remove tough stubborn stains. Ensure to keep the drain plug open to allow moisture to escape. Igloo Yukon Cold Locker cooler is manufactured by one of the best manufacturers renowned for many decades producing heavy-duty high quality coolers in the market. 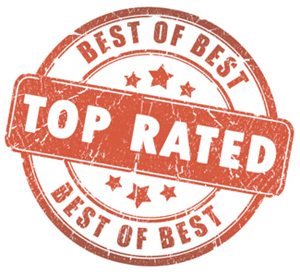 No bogus ads, you’ll enjoy exactly what you expect. The Yeti and Grizzly coolers may be a hot name right now, but Igloo has been around for significantly longer. In fact in our Five Day Ice Challenge the Igloo Sportsman Series cooler held ice just as long as the Yeti Tundra. Yet, the Yukon is usually available at a much more affordable price point. Yukon coolers offer an integrated fish ruler, a convenient ruler into its lid which you can’t find in many other brands. Yukon uses no rope handles, instead a steady sturdy wide grip handle constructed to handle harsh and heavy handling. Who Should Buy The Igloo Yukon? For someone who values a trusted name and quality, you’ll never get wrong to choose Igloo Yukon Cold Locker cooler. Serious adventure riders and fishermen or people who love camping and going outdoors.